Strawberry shortcake is about as American as apple pie, and nearly everyone loves to have a serving of this tasty dessert now and then. However, the traditional recipe isn't suitable for everyone's diet, so if you're looking for a healthier alternative, one of these recipes should work well. Substituting wheat flour for all-purpose flour adds some grainy goodness to this dessert. Raw honey is a sweet super food that replaces the nutritionally bankrupt processed sugar used in most shortcake recipes, and it can also add a little sweetness to the strawberries, if you find you need it. Creamy Greek yogurt makes a delicious and nutritionally superior alternative to whipped cream topping. Put the jar of coconut oil in a pan of warm tap water for about five minutes so it will melt before you pour it into your measuring cup. In a mixing bowl, stir the flour and baking powder together. In a separate bowl, combine the eggs, 1/2 cup honey, oil, milk, and vanilla. Whisk to combine. Add the flour mix to the egg mix and stir just until combined. Avoid over stirring so the shortcake doesn't turn out tough after baking. Spray an 9 x 9 x 2-inch baking pan with cooking spray, scrape the batter into the pan, and level it. Bake for about 20 minutes or until the top is light golden brown and springs back when tapped in the middle. Remove the pan from the oven and let cool completely before assembling your shortcakes. While the shortcakes bake, wash the strawberries and let them dry in a colander. Slice them into a large bowl and remove the green tops as you go. Drizzle 1/4 cup or less of honey over them and toss lightly. You can also feel free to omit the honey and just use the strawberries without any sweetener. Put the strawberries in the refrigerator for about one hour to chill before assembling your shortcakes. Slice the cooled shortcake into six pieces, and place each slice on a dessert plate. 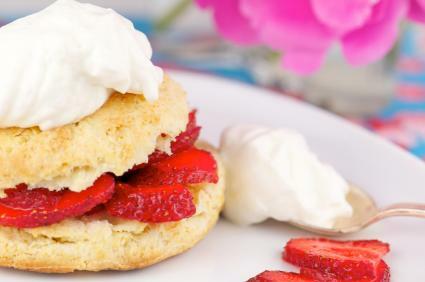 Using a spoon, divide the strawberries evenly over each piece of shortcake. Top with a dollop of Greek yogurt and serve immediately. This recipe yields drop biscuit-style shortcakes that are gluten-free since they're made with almond flour instead of all-purpose flour. Just be aware that almond flour doesn't rise quite as high as regular flour. Agave syrup is considered low on the glycemic index and may be a slightly healthier alternative to processed sugar since it's sweeter and you can use less of it. Put the jar of coconut oil in a pan of warm tap water for approximately five minutes so it will melt before you pour it into your measuring cup. In a bowl, combine the flour and baking powder, and stir them together. In a separate bowl, combine the oil, eggs, agave, and lemon juice. Whisk to combine. Add the flour mix to the egg mix and stir until just combined. Line a baking sheet with parchment paper, and drop 1/4 cup of shortcake dough on the sheet. Continue dropping 1/4 cupfuls of dough at roughly two-inch intervals. This will yield about eight shortcakes. Bake the shortcakes for about 17 minutes or until they are light golden brown and don't sink in when tapped in the middle. Remove the shortcakes from the oven, allow to cool for five minutes, and transfer to a baking rack to finish cooling. While the shortcakes are baking, wash the strawberries and let them drain, and slice them into a medium-sized bowl. Drizzle the berries with one tablespoon or less of agave syrup if you feel they need a little extra sweetness. Chill the berries in the fridge for about an hour before use. Slice each shortcake in half, and place the bottom halves on dessert plates. Spoon strawberries over each bottom layer and try to divide the berries evenly. 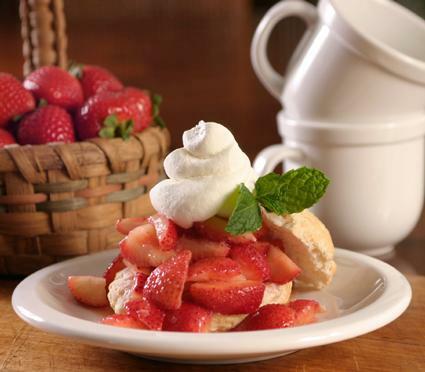 Place the shortcake tops on the strawberries, and top each serving with a dollop of yogurt. If you need to avoid eggs, substitute this shortcake for any of those mentioned above. Line a baking pan with parchment. Sift flour, sugar, and baking powder into a bowl. Add butter and orange zest, cutting butter into pastry with a pastry cutter or two knives. Stir in milk and mix into a soft dough. Flour a surface and roll dough out until it is 1/2 inch thick. Use a round biscuit cutter to cut into rounds. Bake until golden, about 12 to 15 minutes. Top with fruit topping, such as sliced strawberries and sugar, and whipped cream. If you prefer a juicier topping for your shortcakes, try adding unsweetened, organic applesauce to your sliced strawberries. This recipe will cover about six shortcakes, and it's easy to increase if you need more. Adding another half quart of strawberries and another half cup of applesauce will cover about eight shortcakes. You can use this topping with either of the basic shortcake recipes above. Wash, drain, and slice the strawberries into a medium-size bowl. Pour the applesauce over the berries and stir gently. Cover the bowl and refrigerate for about four hours, stirring the contents occasionally. When you're ready to assemble your shortcakes, put them in dessert bowls, and spoon the berry and applesauce mix on top. Top the berries with your favorite yogurt if you like and serve immediately. 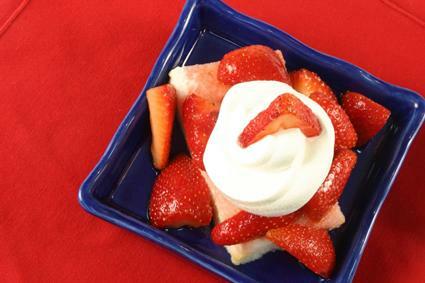 Although these recipes for strawberry shortcake do produce a healthier version of this classic dessert, keep in mind that it's still possible to have too much of a good thing. You can enjoy this dessert once in a while, but don't serve it every night, even though you may want to!